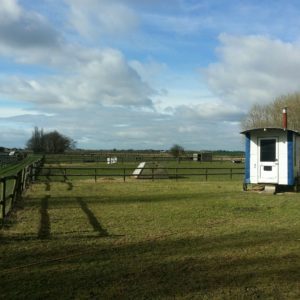 It was a gorgeous day in the Fens today and it really felt as if Spring as on the way. There are Snowdrops in our wood and the trees are in bud. This was the view across our paddocks this afternoon. I spent the day in the Polytunnel planting some Sweet Chestnuts. One of our long term projects is to increase the size of our wood and expand the tree species that we have growing on the smallholding. Sweet Chestnuts will provide both a wood and nut crop. Rather than buying in trees I like to grow the first batch from seed then take cuttings. I get all my tree seed from Tree Seeds Online the seeds come with clear instructions and I’ve had good germination rates. I’ve started using deep tomato pots from The Garden Superstore for any trees with a deep tap root. The pots I’ve planted the Sweet Chestnuts in are 26cm deep which should be more than deep enough and being square they take up less space. As well as planting my Sweet Chestnuts I re-potted the Alder and Staghorn Sumac that I grew from seed last year. I’ve got about 30 of each which isn’t bad for a few pounds, if you’ve got the time, space and patience growing from seed is very economical. I also planted on a few Lavender plants and Hollyhocks that have been overwintering in the Polytunnel and needed a bit more space. Here’s a picture of the Sweet Chestnuts in their long square pots, the Staghorn Sumac, Alder and the Sweet Peppers. I’m going to be growing some other trees from seed this year Walnut, Olive and Oak. I think the Olive will be the most challenging. A lot of tree seeds need to undergo Stratification before they will germinate. This means simulating winter temperatures and is most easily done using the fridge. Olive seeds also need to undergo scarification which is a process designed to make the testa (seed coat) more permeable to water and gases (and thus more likely to germinate). A quick update on the hot bed we constructed last week. After we had finished construction the temperature of the bed was 10C. The following day saw a slight increase in temperature to 12C. At that point I was expecting a gradual increase of 2-3C each day. However, on day 2 the temperature shot up to 23C. I’m definitely going to try growing some pineapples in the bed and also use it for starting tender seeds and for growing on my sweet peppers. 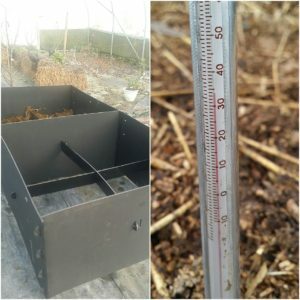 As I mentioned in the last post we used an easy reach, raised bed kit from Solway recycling which gave us a height on 62cm for the bed which I think was instrumental in the success of the heat generation. The bed is 1220cm x 1220cm and I have another next to it that I will be filling up next weekend. The bed was filled with a mix of pig muck, straw, chicken muck and wood chippings. We currently have our pigs indoors because the paddocks are so muddy which means we have plenty of pig muck and straw each week. Once the pigs are outside again I’ll be using horse manure to top up the beds. Here’s a picture of the bed in construction again and the current temperature. 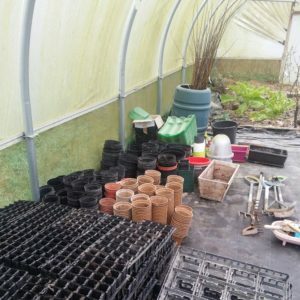 I spent today tidying up the polytunnel ready for a new growing season. I can get to all my different sized pots and seed trays now. In the background you can see my Tree Cabbages. I’m gradually adding perennial vegetables to the polytunnel. As well as the tree cabbages we also have some nine star perennial broccoli which we haven’t tried yet. Of course the fruit trees are still in place as is the raspberry bed, grape vine and willow patch. I’ve got some spring onions and carrots in the raised bed already and the elephant garlic that I planted in November is just starting to appear. I grew a lot of cabbage last year but with the tree cabbages doing so well I’m not doing any this year. I have now got all my seeds for the year. 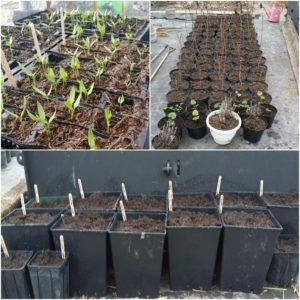 The first seeds to get planted will be the sweet peppers. They need to in by the end of January to have any chance of a long enough & warm enough growing season. I’ve got a heated propagator so hopefully that will help getting them off to a good start. I’m going to try lots of different varieties and see which does the best. The tomatoes were very sucessful last year so I’m going to try some different varieties including more heritage plants & some that have an early harvest. I’ve also got some small cherry tomato seeds which I’m planning to grow in our front porch,with basil, to take advantage of the south facing aspect and also so that it’s easy to grab some when cooking in the kitchen. I’ll be doing another trough of cut & come again salad leaves. I much prefer freshly picked salad leaves rather than the bagged up stuff from the supermarket. Growing them in the trough means I can move then aroubd easily and have them near the kitchen or campfire cooking area for super fresh salads. Another staple for us is spring onions which are particularly good in the straw bale garden. I did some sucesssional planting last year and we’re still harvesting now. 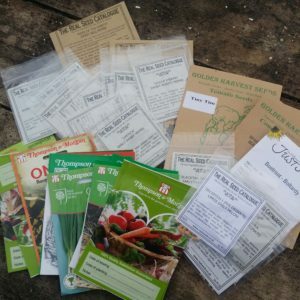 I haven’t grown carrots for a few years but as well as the early ones I’ve already got in I’ll be doing regular sowings throughout the growing season together with some shallots which I’m growing from seed rather than sets. We’re still enjoying the basket of fire chillies that I grew and dehydrated in 2015 but I”m going to grow some jalapeños this year, hopefully to have fresh as well as to dehydrate and store. Building on my sucessful with melons in 2016 I’m going to try growing a watermelon as well as the galia type that I’ve already grown. In 2016 the polytunnel did turn into a bit of a squash forest towards the end of the summer. To try & avoid that I’m going to grow Butterbush butternut squash which has a more compact habit. I’m also going to grow spaghetti squash again because they were so delicious. My new challenge for 2017 is going to be sweet potatoes. I’ve got slips suitable for growing in the UK ordered for June. Having enough heat seems to be one of the keys to success so I’ll start them off in my heated propagator and then use cloches. Fingers crossed for sunshine, just the right amount of rain & a lack of pests.